The Tudor Revival house look has its roots in the reed-thatched cottages once found in the European countryside. As Europeans immigrated to the United States, they recreated this reed-thatched appearance using steam-bent cedar shingles. The curved cedar shingles provided the same style of a reed-thatched cottage, but with far greater durability — a far longer-lasting solution. Today, the unique, intriguing and charming appearance of the Tudor Revival house roof is still available. The Tudor Revival architecture characteristics are unmistakable, and they can add the beauty of a country cottage to any modern home, whether new or old. While more than a century has passed since the English Tudor cottage roof first appeared, its recognition and appeal continues to grow. You can see examples of Tudor cottage shingles in our portfolio. If you're interested in unlocking the timeless charm and long-lasting durability of the English Tudor cottage roof, contact us to request a quote. A Tudor Revival house roof is generally made of of cedar shingles, but teak or other species can also be used. 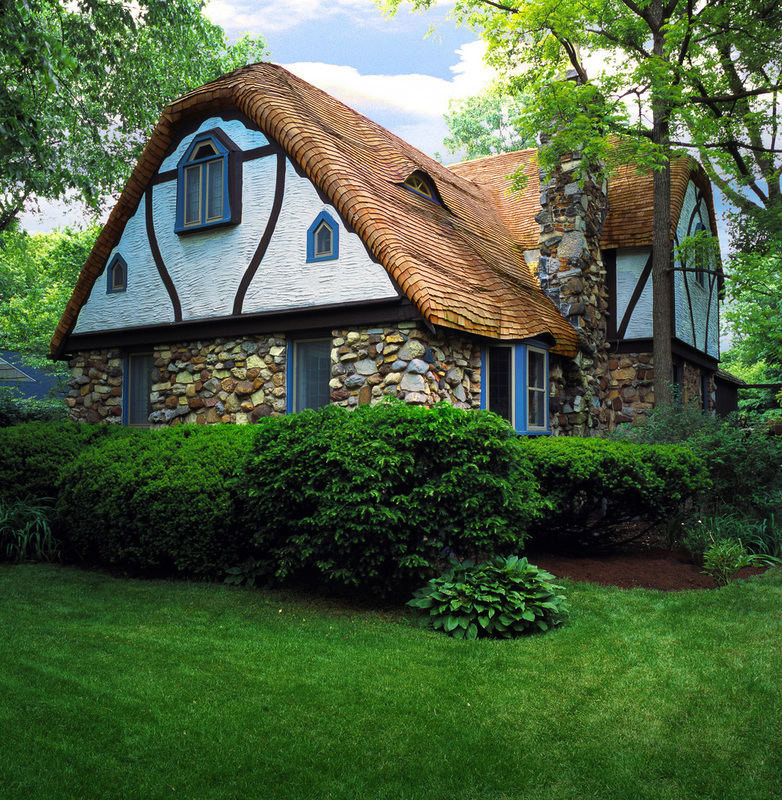 At Custom Shingles, we still steam-bend our shingles, just as the original creators of Tudor cottage shingles did. We use a special softening process to ensure the Tudor teak and cedar bend without compromising the integrity of each individual shingle. The result of our careful process is a Tudor Revival house roof that looks beautiful but is also strong against harsh winds and weather — a truly lasting roofing solution for your home and one that captures traditional Tudor Revival architecture characteristics. Expect Tudor cedar shingles to last about 30 years or more, while Tudor teak will perform for about 80 years — far longer than other styles of roof common today. Cedar shingles deliver strong form, temperature resistance, a fine texture, timeless beauty and natural insulation for your home. Teak offers durability that can’t be matched by other shingles materials, as well as cost-effective sourcing and weather resistance through even the harshest storms. An English Tudor cottage roof is perfect for older structures that need help in recapturing their original charm and beauty. But aging Tudor Revival homes are treasures that must be cared for through highly skilled service and shingle installation. At Custom Shingles, we know how to install Tudor Revival house roofs while also caring for the original structure as we help it recapture its uniqueness and character. Tudor teak and cedar roof options are unique, and each requires specialized skills for effective installation. At Custom Shingles, we can offer our expertise far beyond your Tudor Revival house roof installation date. We can also help ensure the life of your English Tudor cottage roof through the use of moss-elimination techniques that keep your roof looking clean and new throughout the seasons. We can provide regular maintenance service, including special pressure washing techniques that rid your roof of moss and prevent future buildup. When you want the beauty and charm of Tudor cottage shingles, you need an experienced and knowledgeable provider of installation services — a provider like Custom Shingles. Contact us to learn more about your Tudor Revival house roof options or to request a quote.